The Berenstain Bears Storybook Bible for Little Ones… a MUST HAVE for Berenstain Bears fans! This book even appeals to my 9 year old Berenstain Bears fan! The stories appeal to little ones, but are told in a much better way. It’s a wonderful retelling of our most beloved Bible histories – done in a way that makes them easy for young ones to understand. Not to mention they feature our favorite Bear characters… who kids LOVE! Another wonderful book from the Berenstain family of writers! This is one I can see my daughter holding onto for her own children one day. Don’t miss this wonderful storybook – filled with our most beloved Bible Histories! – Tweet this! Our Beloved Bible – BEAR COUNTRY STYLE! – Tweet this! The Berenstain Bears Storybook Bible for Toddlers is perfect for young children. Now toddlers have a padded board book edition designed just for them, with simple text, bright art, and a padded cover. This cute and durable edition provides an overview of the Bible with ten stories from the Old and New Testaments, that follows the Bear family as they explore Scripture. 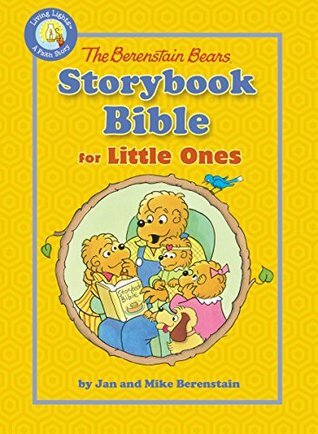 The Berenstain Bears Storybook Bible for Toddlers is fun and enlightening for kids and a great resource for parents and educators. “Harvest Festival” | Newest installment in the wonderful series that has been continued by the talented Mike Berenstain! The article postulates that we are living in an alternate dimension… I know it sounds more like science fiction than reality but the hook was this: The article’s author claims they remember The Berenstain Bears being the Berenstein Bears. Funny thing is; I do too! In fact, I can remember asking my mother if it was pronounced “stane” or “stine“. I had an unfortunate experience in elementary school involving a character named “Ace”. I won’t go into the whole painful thing here but I’m sure you get the idea… That incident is seared into my memory by association. What does this have to do with my review? Nothing. It’s just an intriguing puzzle – one that will most likely never be solved because for every group that remembers “ei”, there are just as many who remember “ai”… and just as many who never read the books so they have no idea. I still remember reading these wonderful books when I was a kid… of course that was when Stan & Jan were writing them. And it is so wonderful to have this amazing series continuing so I can share the stories with my own children. Harvest Festival is a wonderful story about the TRUE meaning of Thankfulness – something we should ALL be reminded of. So it’s a great book for children AND their parents. Bless you Mike, for having the courage to present wholesome and Biblical stories that kids will enjoy for many years! And hopefully, share with their own children! Don’t miss this book. And be on the lookout for more from Mike Berenstain! I know I will! 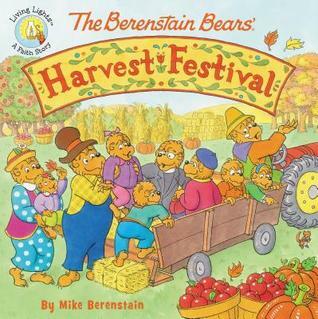 Mike Berenstain continues a beloved series with – Harvest Festival! Don’t miss it! – Tweet this! Harvest Time is right around the corner. Celebrate with Bear Country! – Tweet this! Autumn is a beautiful time of year, and the folks of Bear Country are looking forward to everything the season brings. So when the Chapel in the Woods holds its first ever Harvest Festival, people gather at Farmer Ben’s for a wonderful time of family, friends, fun, and praising God for his gifts. Join the Bear family as they attend the first ever Chapel in the Woods Harvest Festival in this newest addition to the Berenstain Bears Living Lights series, The Berenstain Bears Harvest Festival. With fun activities like apple picking and hay rides, this is sure to be a great way for the Bears to spend time together! WOW! “God Bless Our Country” is THE BEST I have see yet in this series that has been continued by the talented Mike Berenstain! This is the first one of these books I have reviewed and it is definitely my favorite so far! Of course I haven’t read all of the new ones so that may change. I remember reading these wonderful books when I was a kid… of course that was when Stan & Jan were writing them… and I am thrilled to see that their son Mike loved the books so much, he has continued with the very series his parents loved so much! Thank you and God Bless you Mike! It is wonderful to have this amazing series continuing so that I can share the stories with my own children. No one should miss this wonderful book! Mike has truly captured the style that made his parent’s books in this series famous with children everywhere! And this particular story – well, it could have been a tough one to translate into “Bear Country” speak… but Mike did an exceptional job! He gets the major points across in a way that makes learning about history FUN for kids! 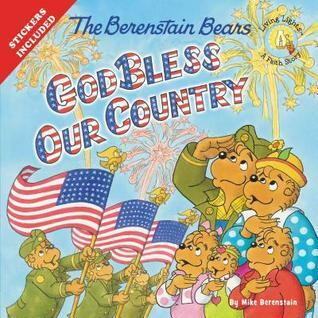 Mike Berenstain continues a beloved series with – God Bless Our Country! Don’t miss it! – Tweet this! Birth of the U.S.A. – BEAR COUNTRY STYLE! – Tweet this! The Bear family and their Bear Country neighbors celebrate the Fourth of July with a big parade. But not before the Bear cubs get a lesson about the blessings of freedom for their country. In the newest Berenstain Bear Living Lights 8×8 title, the glorious fourth has arrived and the Bear family is busy decorating with flags and bunting. Brother, Sister and Honey are anticipating the big parade and all the fireworks but aren’t really thinking about the true meaning of the day. But Mama and Papa make sure the cubs know just how much Bear Country is blessed with a quick lesson about the first Fourth of July.